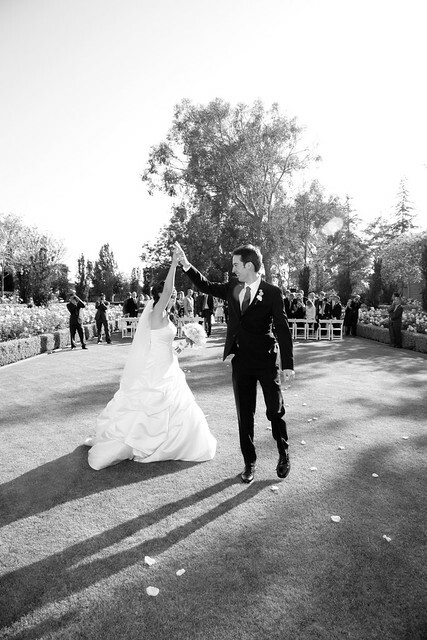 The Astronomer and I got married exactly two years ago today, under sunny L.A. skies with our family and friends around us. It was one of the happiest days of my life, one that never fails to put a huge and goofy smile on my face every time I think about it. With our second anniversary upon us, I wanted to gift The Astronomer something in line with tradition, but with an edible spin. For our first anniversary, I made two varieties of Vietnamese spring rolls, goi cuon and bo bia, to represent paper. Since it is customary to bestow cotton upon one’s beloved in recognition of the second anniversary, I briefly contemplated whipping up some cotton candy, but ultimately decided to prepare a feast of cottontail. 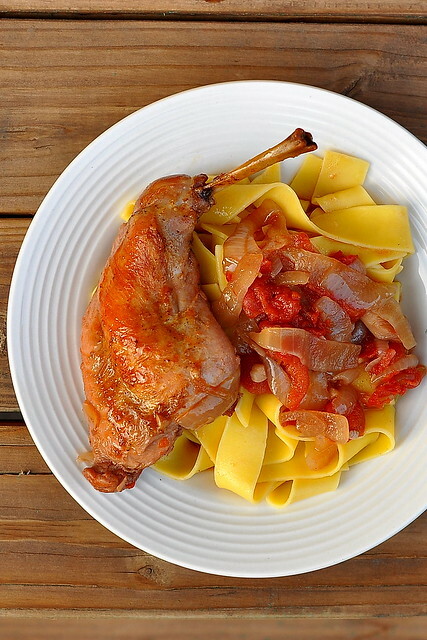 For my first foray into rabbit cookery, I chose this straightforward recipe for Braised Rabbit with Egg Noodles from the May 2003 issue of Gourmet. Braising, a technique that calls for meat to be seared at a high temperature and then finished in a covered pot with liquid, practically guarantees moist meat and robust flavors. It sounded like the kind of forgiving recipe that would be ideal for this first timer. After bathing in an aromatic brew of onions, garlic, orange zest, cinnamon, and red wine, the meat was fork-tender while the sauce was deeply savory with mellow citrus notes. The flavors whisked our taste buds away to the Mediterranean. Dinner was served outside on our picnic table, with snappy asparagus on the side and glasses of red wine to sip. The Astronomer requested seconds. 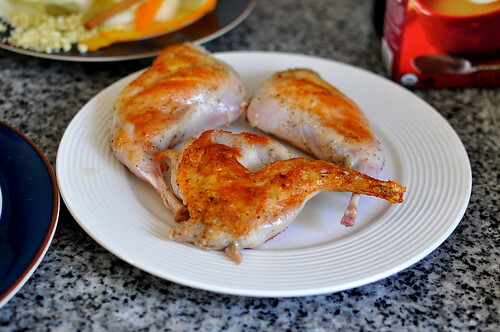 Pat rabbit pieces dry and sprinkle with 1/2 teaspoon salt and 1/4 teaspoon pepper. Heat 2 tablespoons oil in a deep 12-inch ovenproof skillet (preferably with a lid) or a 5-quart wide heavy pot over moderately high heat until hot but not smoking, then brown rabbit in 2 batches, turning over once, about 6 minutes per batch. Transfer as browned to a plate. 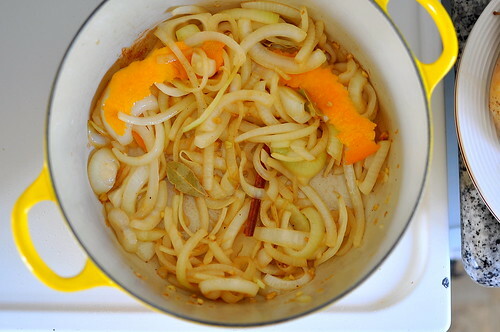 Reduce heat to moderate and cook onions, garlic, zest, cinnamon stick, and bay leaves in remaining 2 tablespoons oil, stirring frequently, until onions are beginning to brown, 4 to 5 minutes. Add wine and deglaze skillet by boiling, stirring and scraping up any brown bits, until wine is reduced by about half, about 2 minutes. Stir in tomatoes, water, remaining 1/2 teaspoon salt, and remaining 1/4 teaspoon pepper. 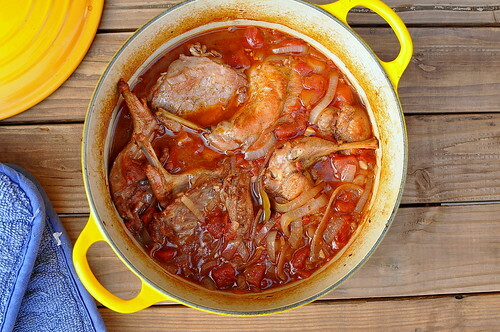 Nestle rabbit pieces in sauce and bring to a simmer. Cover skillet tightly with lid or heavy-duty foil, then braise in middle of oven 30 minutes. 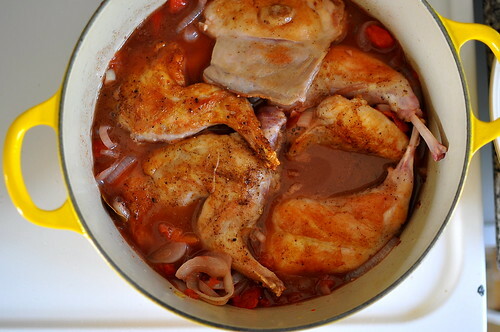 Turn rabbit over and continue to braise, covered, until rabbit is tender, 25 to 30 minutes more. While rabbit is braising, cook the pasta in a very large pot of boiling salted water until just tender, but still firm to bite. Drain and return the pasta to the same pot. Stir in a ladle of sauce and swish around, lightly coating the noodles. This will keep the pasta from clumping together and imbues the sauce’s flavors into the starch. Discard zest, cinnamon stick, and bay leaf from sauce. Arrange rabbit over pasta, then spoon sauce over top and sprinkle with parsley. Aww, Happy Anniversary! I still remember your post last year reliving your wedding feast. Oh how fun, where did you buy the rabbit? Thank you, Kirbie and DF! Darin – Bristol Farms. My first choice was Peking Poultry or Superior Poultry in Chinatown, but they only get rabbits in on Wednesdays and sell out quickly. I will plan better for next time! Mmmm, wabbit. Happy anniversary to you two. What a fab way to celebrate. lol! nice interpretation of cotton! it looks delicious!! happy anniversary! Happy anniversary! You guys. Way too adorable. has it really been 2 years already! congratulations, looks like you two celebrate in the most delicious style. what a beautiful meal for a beautiful pair.